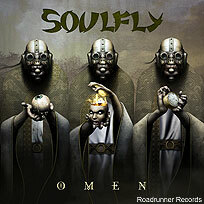 Soulfly release their seventh studio album, 'Omen,' this week on Roadrunner Records. The eclectic metal band -- whose frontman, Max Cavalera, visited the Noisecreep offices earlier this year -- enlisted digital artist and Californian David Ho to produce their cover art. Ho explained a bit a bout the ominous cover to Noisecreep: "The lead singer from Soulfly liked a piece of artwork I created for Lucasfilm that depicted a very stylized Tusken Raider. So the creatures were inspired by them." Tusken Raiders were a fictional band of violent, grunting desert dwellers in George Lucas' 'Star Wars' universe that were highly unfriendly to Luke Skywalker in the first Star Wars film. "In total, there's seven figures (three on the front, four on the back)," Ho explained further. "The lead singer from Soulfly wanted seven figures to symbolize their seventh album. And since the title was Omen, I thought it was somewhat religious in nature so I had in each figures hand one of the seven deadly sins." Soulfly have a string of European dates scheduled this summer to support 'Omen'.